Midwest Photographic has the solution for your sticky cover problem on the old Futura and Perma Bound. Watch the video and read below for more information. 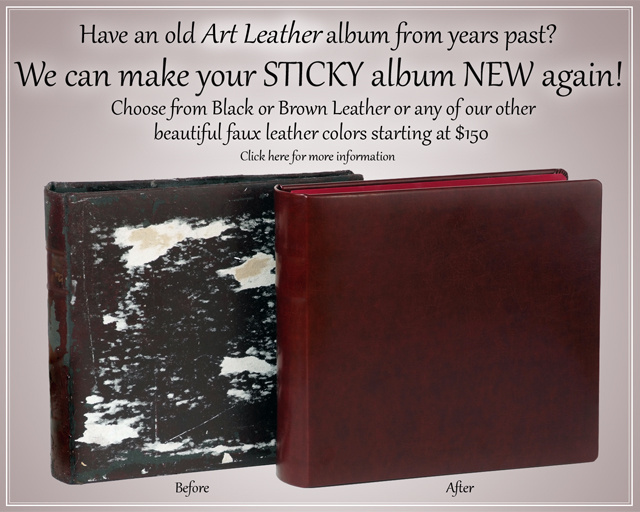 Sticky Covers: In the late 1980's Art Leather made the Futura and Perma Bound covers from a bad batch of aristohyde which started to deteriorate twenty years later. You will need to send us your cover for repair. We will dispose of the bad material and refinish the album like new for $150. Click here for the Album Recover Order Form. Most questions can be answered by this video but also feel free to call us at 636-970-0540. We can not recreate the oval picture opening on the front of the cover. We can create a center square opening for a photo on the front (shown in the video). ALL sticky covers have to be sent in for repair, we do not have replacements anymore. Covers will not be returned with a presentation box. *Green faux leather is no longer available.